Maybe the font is big because i was editing this as the plane took off. Is that why they tell you to shut down electronic devices? You're setting a bad example. A group of about 100 high school students traveling from New York to Atlanta were thrown off an AirTran flight, along with their chaperones, after the pilot and crew lost patience with some kids who wouldn't sit down and put away their cellphones. No kidding. Sleepy on here too. The condo building I'm looking at had a single unit (unit A) for sale for around 100% of assessed value. Been sitting on the market for a long time. Now a second, nicer unit (unit B) has come up for sale at 92% of assessed. Does anyone think the fact that the nicer unit is so far below assessment could be used as ammunition to low-ball the at-assessed value unit? My thought is that since A has been stale for so long the seller probably isn't motivated to sell, and would prefer to stick it out for the price they want to get. Will we follow in our big brother's foot steps? "Does anyone think the fact that the nicer unit is so far below assessment could be used as ammunition to low-ball the at-assessed value unit?" Think about the price you want to pay. Go tell them that price. Worst case scenario they will call you names. It really depends on where the condominium is located. Better luck with a low ball offer in Langford than in the downtown core. The market is still strong enough in the core that all the home owner has to do is lower the price and they will start to get offers. There is no reason to accept a low ball offer if the property is in the core. If you want to low ball properties in the core you should be looking at foreclosure, divorce, relocation or estate sales where the owner(s) are no longer involved with the sale or are very motivated to get on with their lives. I like it when people call me names. It is a negotiation, not a discussion between friends. If you go in wanting to be liked, most likely the realtors (both of them unless you are lucky with a buyers realtor, if any) will hose you. who cares if they say no? All it is is a bid, nothing more. Is a low ball offer a "negotiation"? It sounds pretty one sided. You might be more successful if you don't have your own real estate agent. At least the listing agent can cut their commission to better the deal for the home owner. The agent(s) is the buffer between you and the vendor. You can jump up and down and act like a Diva but none of those histronics get passed to the home owner. I'm assuming that your low ball offer is below market value. I just don't see why a home owner that is not under duress to sell would need to accept your offer. Maybe you could present better terms with your low ball offer. The vendors get to stay in the home at a below market rent for six months while they look for a new home? In this case my low-ball would be below assessed, and below asking, but I don't believe below market. The unit directly below them sold two years ago for $40K less than they are asking, so given what's happened in the past two years, and the premium for a floor higher (and top floor, which the unit we're discussing is), I think paying maybe 10-15K premium over one-floor-down is fair, but 40K seems like a big jump. Hence, I'd want to low-ball to hit market, not go under market. My feeling is the asking/assessed is high, which is why it hasn't sold. Other item of note is that the unit has been empty the entire time it's been on the market. Good discussion though everyone, thanks again. I think if the unit has been on the market for a long while and has not sold that says it all - it is too expensive. Any place will sell at the right price - the sellers just have not accepted that yet. It seems a lot of people base their decisions on the BC Assessments. Looking at non view condominium sales for the City of Victoria over the last three months shows that the average ratio of sale price to assessed value is 95%. But the range is wide. From a low of 72% to a high of 120%. In my opinion that makes the use of a Sales to Assessment Ratio in determining the value of an individual property unreliable. At best you would only use the Sale to Assessment Ratio as a cross check to see if your offer falls within the range. I wouldn't write a cheque based on what an overworked government assessor has determined as the suite's value. Given that they may have spent a few minutes reviewing a computer print out of the complex. Each Assessor reviews about 20,000 properties each year. Even at the right price the property may not sell readily. The number of Days-on-Market is increasing. Or to put in another way, prices may be stable to decreasing but homes, on average, are taking much longer to sell. Most banks have adopted an arbitrary 30 to 90 day list period as part of their instructions to estimate a value for a property. That's ridiculous if you are looking at waterfront or hobby farms today. It may take 6 months or a year to find a buyer for these types of properties even when listed at or slighly above market value. Dropping the price by 5 or 10 percent will not make these unusual properties sell any quicker. House prices in Victoria have dropped in 8 of the last 10 months. 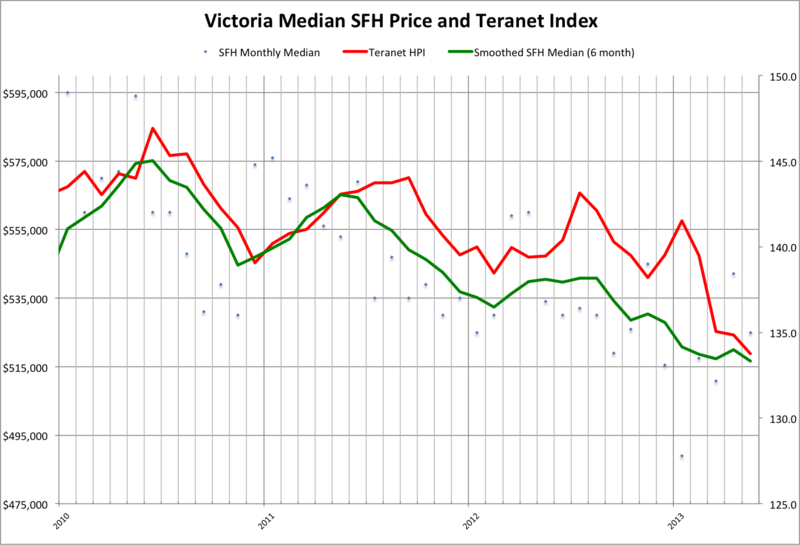 Over the past 4 months, prices in Victoria have fallen 5.5%, according to the Teranet index (January through May). The rate of price decline has accelerated. House prices in Victoria are not stable. Not at all, in fact. Sure, it accelerated in 6 of those 12 months, but it also decelerated in the other 6 of those 12 months. More recently, sure it accelerated in three of the past four months, but the one deceleration was a big one. I may or may not think the bottom's going to drop out of the market, whatever, but to draw the conclusion you did from the data at hand is a stretch in my opinion. As I said, house prices in Victoria have dropped in 8 of the last 10 months. Clearly, the rate of price decline has increased since the peak, especially over the last 6 months. Be ready for new lows. Clearly, the rate of price decline has decreased in the past 12 months, especially averaged over the last three m/m comparisons. See, we're both stating entirely accurate, but misleading things. In May, based on April's stats, I could have said "The rate of price decline is decelerating quickly" and it would have been factual too. It's cherry picking stats. And the market for age restricted condominiums continues to worsen. A 1500 square foot remodelled Cook Street Village condominium bought March 2007 for $360,000. Re-sales today for $329,000. But you'll have to put your gonads under your hat - no one under 19 need apply. To early to tell if the decline is accelerating. I suspect it is, but it will require some more months to confirm. 7 new listings in OB over 1 Million yesterday and today. Why would these houses not have been listed in Spring instead of summer. Were these folks hoping for a price spike before listing. Anyhow it only adds to the MOI in homes over a million. Because in the spring they were still in Hawaii, drinking Mai tais, oblivious to the realities of the plummeting Victoria market. Well the Mai Tai sippers will be dropping their prices over the next few months as MOI piles up. I'm thinking Aug 1st we'll start seeing price reductions as time runs out on the summer market.